In our first installment of this series we looked over the actual factual, evidence of both Christopher Columbus and Leif Eiriksson discovering the Americas. Arguably, you could say Columbus discovered South America, and Leif the North. I would say, simply touching a rock on one park of a massive continent complex doesn’t equal discovering both bits of America, but that’s my opinion on the matter. Apparently some folks agree with me, because there have been several claims around North America of evidence of Vikings. We’re going to go over them, and see if there is any merit to these claims. Newport, Rhode Island is said to have a singular structure, surely evidence of Vikings. The Newport Tower, aka Old Stone Tower, aka Touro Tower, aka Old Stone Mill, aka…anyway you get the point. The Newport Tower stands at the west end of Touro Park. 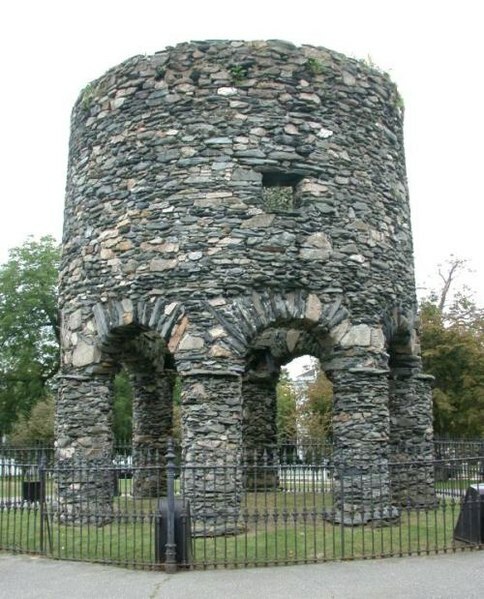 It is a round stone structure that was preserved in 1854 when Judah Touro donated $10,000.00 to the City of Newport to conserve it and the land around it (Barstad 2007, 2008). Until recently, little has been known about the tower, except some speculation that the Tower might have been built by Vikings, but is there evidence? Certainly there is no other known Norse structures around, or Nordic artifacts, or anything else to suggest the Norse were ever in the area, but you do have to admit, the tower does look strange. It doesn’t look like other known 17th-century structures, which are often square or rectangular and built of wood. New England smock mills are described as tapered, with narrow tops and wide basis, and almost always built of wood (Barstad 2007, 2008). It has a very rustic look to it, made out of stone, it even has those weird arches at the base. Does it match up to any other known Nordic structures? Not as far as I can tell. Still there is enough going on here that it’s worth looking at the unusual structure. Instead he did find pottery sherds, iron nails, clay tobacco pipes, buttons and buckles, all traceable to Scotland, England, or the English Colonies in America. All were dated to between the 17th and 19th centuries (Godfrey 1951,Feder 2006:117). He even found a preserved boot-print in the soil beneath the stone foundation (Godfrey 1951, Feder 2006:117). Later in 2006 and 2007, The Chronognostic Research Foundation sponsored their own research on the Newport Tower (Barstad 2007, 2008). They used several different techniques that would not have been available to Godfrey, including ground penetrating radar (Barstad 2007, 2008). They identified quite a bit about the history of the park and they increased the amount of 17th, 18th, and 19th century artifacts found in association with the tower, backing up Godfrey’s findings (Barstad 2007, 2008). I’m mildly hesitant to use Barstad’s work, mainly because of the conclusions she draws at the end of the 2008 report. Specifically that the Tower is really an observatory and that it was built around 1125. Her Observatory conclusions are biased on window orientation, making the case that two windows line up for the sunset on the winter solstice, but she seems to ignore a clearly visible, filled in, window. Not to mention the Chesterton Windmill, thought to be the actual model for the Newport tower, displays similar windows and is clearly a mill. Chesterton Windmill in Warwickshire, England. “We’re 99.9 percent sure the tower was built as a windmill by Governor Benedict Arnold in the 17th century.” When asked about the remaining 0.1 percent of doubt, the member added, “Oh, well, the public does so love a good mystery, we like to leave a bit for them.” (Barstad Nd). The first known mention of the Tower is in Gov. Benedict Arnold’s 1677 last-will-and-testament, where he uses it as a landmark for where he wanted to be buried (Barstad Nd, Feder 2006:118). 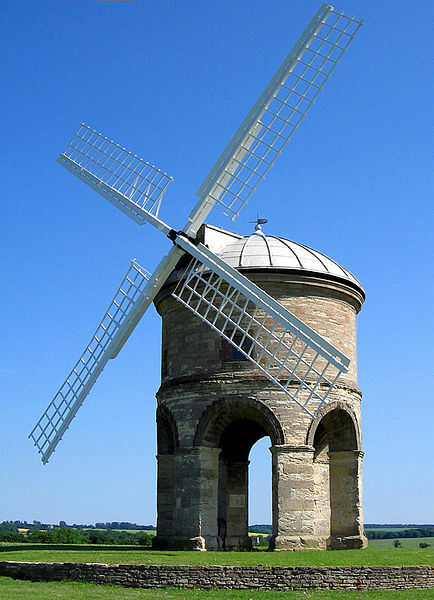 Arnold was brought up near Chesterton, England and the design of the mill was well-known there (Feder 2006:118). Most likely, he built a similar one when he got to the colonies (Feder 2006:118). Apparently, the origin of the Norse idea began in 1830, when Carl Christian Rafn, the then Danish secretary of the Royal Society of Northern Antiquities in Copenhagen, suggested that the Tower was built in the 12th century by the Norse. He never saw the tower, so was making a guess based on the descriptions of others, specifically a drawing by F. Catherwood (Barstad Nd). Rafn suggested that the tower was built under Eric Gnupsson, a bishop from Gardar, Greenland, sometime between 1112 and 1121. The problem here is that Rafn never saw the Tower himself, and as gifted an artist Catherwood was, his picture is known to have inaccuracies, which could have influenced Rafn. For Barstad to use this as evidence of any kind is a little unsettling, especially when there is no other apparent reason to accept such an idea, and the actual evidence is so heavily weighed against it. There are a bunch of other ideas as to how the Tower got here, all attached to the various contenders for the title of “Who Discovered America First”. Some suggest (Barstad mostly) that the Scott, Sir Henry Sinclair, built it while exploring the coast of North America between 1395 and 1398 as part of a planned community (Barstad Nd). There is a Chinese Theory by a retired British submarine commander named Gavin Menzies, who suggests a Chinese treasure fleet (always a treasure involved somewhere) rounded the Cape of Good Hope in the 1420’s built the tower as part of their colony (Barstad Nd). There is a Dr. Manuel Da Silva who suggests the CorteReal brothers shipwrecked in the early 1500’s and built the Tower so that rescuers could find them (Barstad Nd). She even put forward the idea that the Basque built it as a kind of whale spotting tower (Barstad Nd). There are massive and immediate holes in all of these ideas. Hearsay cannot trump evidence, especially in archaeology. We can use a good story to help us formulate a hypothesis, but when the evidence, in the form of artifacts and now ground history, doesn’t support that hypothesis, we must decide on the side of the evidence. Clearly this was not done in this case, and it’s upsetting. Still, the hard facts point to a 17th century birth for the Newport Tower, probably at the hands of Gov. Benedict Arnold, and very probably modeled after the now famous Chesterton Windmill. But this isn’t the only supposed Viking evidence out there, oh no. There is also a very questionable map that we’ll look over next week. Nd “Who Built the Newport Tower?” Arizona Center for Medieval and Renaissance Studies. Arizona State University, Tempe, Arizona. http://www.acmrs.org/about/online-resources/NewportTower. Retrieved Jan/14/2013. 2007 “The Newport Tower Project: An Archaeological Investigation in to the Tower’s Past.” The Chronognostic Research Foundation. Sept 21, 2007. http://www.chronognostic.org/pdf/tower_project_report_2007.pdf. Retrieved Jan/14/2013. 2008 “Discovery Over Touro Park”. The Chronognostic Research Foundation. http://www.chronognostic.org/over_touro_park.html. Retrieved Jan/14/2013. 1951 “The Archaeology of the Old Stone Mill in Newport, Rhode Island,” American Antiquity Vol. 17, No. 2 (Oct., 1951), pp. 120-129 Society for American Archaeology. http://www.jstor.org/stable/277246?seq=1#page_scan_tab_contents Retrieved Jan/14/2013. My company was hired to do a ground penetrating radar survey at the site in the late 90’s. I rand the survey and interpreted the results. The people who hired us expected to find a viking graveyard nearby. We surveyed the entire park. All we found was evidence of Godfrey’s dig, a water line and a large boulder. No buried vikings. Why are Euro and African Americans going to accept they have no deep history in the Americas, except for the Vikings who never entered deep into the continent, and were confined to the outer fringes of New Foundland and Canada a thousand years ago. That is nothing compared to the only real founding of the American Continents , were by the Native Americans 25,000 years ago or longer. There is no question that the first Eurasians to find and settle both continents of the Americas were the Native American Race, who developed and evolved thousands of separate languages and cultures, and evolved so thoroughly their own genetic signatures, that they are more closely related to each other, than any Asian, European or African race. They were the true founders, and it doesnt matter if Columbus or The Vikings were first, because they were not first, but second and third. Now that I think of it, there is alot more concrete evidence that the Polynesians were the ones who should take second place. Just because the vikings were were what you call ” White European” doesnt somehow make their claims any more valid. Real life doesnt work that way! Prince Henry of Scotland landed his fleet on what is now Nova Scotia. They spent summer with the native Indians, but Henry kept his own ship and another ship to weather the New England winter in ‘Stoney Creek,” (?). He and his two crews rebuilt the two ships into a single craft, before the end of the spring which would be the end of the 1399, when he returned to Scotland. The study and artifacts “to a striking degree … conform to the results of research conducted by Harvard University’s William Godfrey in 1948 and 1949,” the Gray & Pape study states. Watching The Viking, 1928, starring Donald Crisp (as Lief Ericsson) and Pauline Starke (as Helga Nilsson, which should be Helga Nilsdatter since she is a girl), on Turner Classic Movies. Something brought me here but for the life of me, I cannot remember. Something about the “tower” in R.I. It was a very good read and I thank you.